I’m really not a picky eater. I never was. Oh sure, as a kid I had my quirks. Don’t we all? But over the years most of my food aversions dissipated. Some of my least favorite foods even became obsessions, like Gorgonzola. Others just became more tolerable as time went on, like celery. Only a small handful of hold-out dislikes stuck with me all through my 20s. 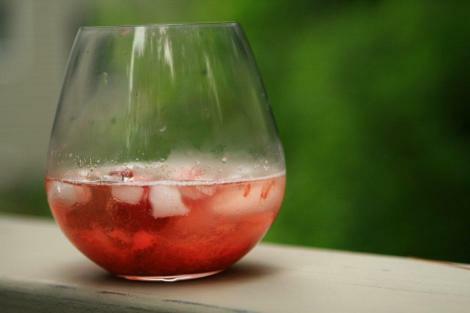 But after I turned 30, something strange happened: I decided to try Jello. Ok, I didn’t exactly decide, I was pretty much forced. But it turned my world upside down. My most reviled food nemesis, the evil sugary, wiggly gelatin, was, in fact, yummy. The Jello episode led me to rethink my other food aversions. As I said, there aren’t many of them. But capers were high on the list. After finding out that the terrifyingly jiggly Jello was actually pretty fun to eat, I had to give capers another try. I’d always believed capers to be overpoweringly briny and obnoxiously chewy. It turns out that I was wrong. Capers add a salty kick to savory dishes and get wonderfully crisp why fried up in a bit of oil. A little jar of capers tucked in your fridge can be a flavor secret weapon. 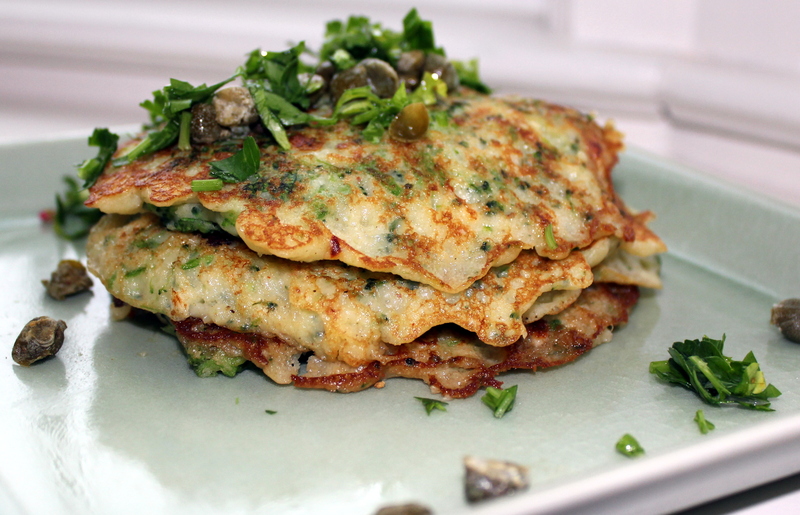 I made these broccoli pancakes to use up a wilting head of broccoli, but it’s the lemon, parsley and capers that make these pancakes special. With loads of fresh, bright flavor, these nutrition-packed pancakes are awesome for brunch along with scrambled eggs, and they make for a great quick lunch with a big green salad. You could certainly change up this recipe, using cauliflower instead of broccoli, and maybe some cilantro in place of the parsley, if you like. But do give the capers a shot. If, like me, you haven’t always been a big fan of capers, you might be surprised. Of course, if you are like Jeff, and have held on to a life-long hatred of broccoli, that’s another story. I would say that you should give these pancakes a try (the buttery batter and fresh parsley do manage to mellow out the brocoli), but I think broccoli-haters are a special breed. You broccoli haters out there are pretty set in your ways. I’ve managed to get Jeff to change his mind on everything from bok choy to quinoa but broccoli is off limits. Which is just fine with me, since it meant I got these wonderful pancakes all to myself! Steam the broccoli until crisp-tender, then cool and chop. Meanwhile, in a large bowl, wisk together the flours, baking powder, salt and garlic powder. Melt 2 tablespoons of the butter in the microwave, and let cool. In a small bowl, wisk together the cooled melted butter, eggs, and milk. Stir the wet ingredients into the flour mixture. Add in the lemon, parsley and broccoli and stir to combine. Heat a griddle and grease with a bit of the reserved butter. Drop the batter by the 1/2 cup onto the griddle and flip when the edges begin to brown. Remove the pancakes and repeat until all the batter is used. Meanwhile, in a small skillet, heat the oil and fry the capers until they begin to brown and get slightly crisp. 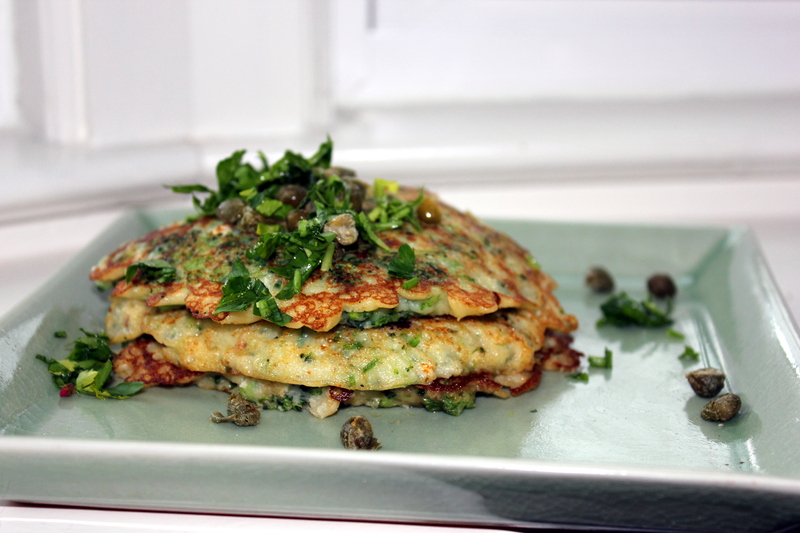 To serve, top pancakes with fried capers and additional parsley. My brother and I have been cooking Mother’s Day brunch since I learned to turn on the stove. I had this great little step stool, with my name painted on it in purple letters, that was just the right height to help me reach the sink. Evan was only allowed to use a butter knife, but somehow we managed. And Mom choked down everything we made – from gritty coffee to undercooked potatoes to crunchy eggs. Thankfully, our brunch menus have improved. Evan has graduated to a grown-up knife and I’ve learned how to properly crack an egg. Do you cook for your mom on Mother’s Day? What do you make? 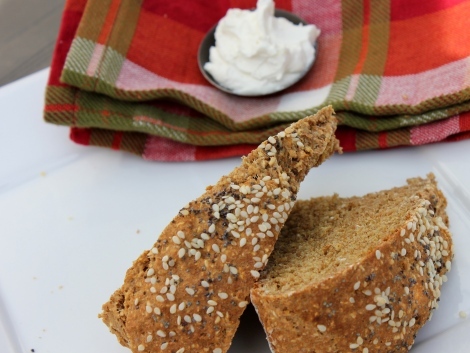 If you need some inspiration this year, check out the brunch menu ideas below.